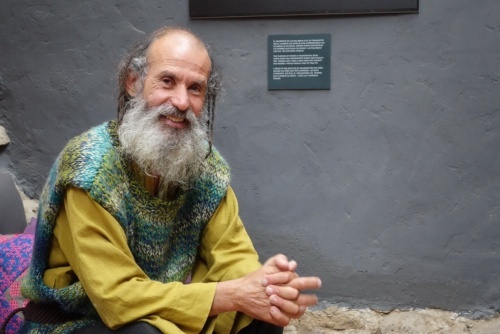 Meet Mau, the gift-hearted founder of a beautiful sanctuary called The Hospital of the Soul on the Camino de Santiago. As this week's song is about seeds, we realise how precious farmers like Mau are invisibly planting deep seeds of transformation in all who pass through their "fields of love". I had always been called to the Camino ever since I read about it in the Pilgrimage by Paulo Coelho, as well as heard personal accounts of many dear friends who had walked the Way. So when we found ourselves in Spain with a couple days in hand, we decided to walk a small portion of the camino for 24 hours in the sincere hope that seeds for a full-blown pilgrimage someday be planted in our consciousness. Among many amazing people we encountered on the way, one that deeply touched my heart and soul was Mau. Mau is a magician of space. He has converted his spacious home in the village of Castrojeriz on the Camino de Santiago into a sacred space called Hospital of the Soul. As you enter the village and walk down the main street, you may completely miss this quiet unassuming home which has just a small board to mark it. As soon as you open the door, you hear beautiful instrumental music gently owning/ occupying the space but with no physical hosts. Every room in the home has a character, filled with pieces of art, books, photographs, quotes on the wall, plants, etc. The home has all the comforts of a modern home with a kitchen, living room, library, serene backyard with waterfalls, an herb garden, etc. There is only one bed-room which is off-limits to all visitors which is Mau’s private space. You can walk around the home as if it is yours. The home as an incredible healing energy that stills the body and mind, and rejuvenates the spirit. Éste amor que fluye bien adentro, aquí hay una semilla..